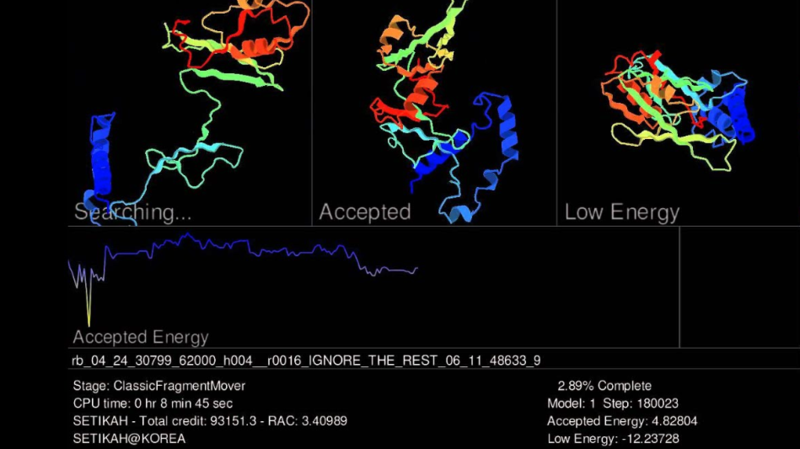 Community computing allows anyone to get involved in protein design — from home. We created a video game which lets anyone contribute to cutting-edge scientific research. Join this free online game and help us to design new proteins to cure diseases, create new materials, and develop new ways of capturing and storing energy. To learn more about the power of people playing Foldit, watch the inspirational film “The Contenders”, a GE FocusForward short film by Lucy Walker. It describes how a team of Foldit players “helped the anti-AIDS drug quest” as reported in this Nature Structural and Molecular Biology Paper published in September 2011 by the Baker Laboratory. We need your help to determine the 3-dimensional shapes of proteins. By running this free program on your computer while you aren’t using it, you can help us speed up and extend our research in ways we couldn’t possibly attempt without your help. You will also be boosting our efforts to design new proteins to fight diseases such as HIV, Alzheimer’s, malaria and cancer. Please join us! Rosetta@home is not for profit.